Gentle and effective washing foam for the body, scalp and face. 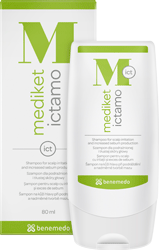 Mediket Ictafoam is a gentle and effective washing foam containing ichthyol pale, designed for daily care of seborrheic skin and other skin problems manifested by itching and irritation. 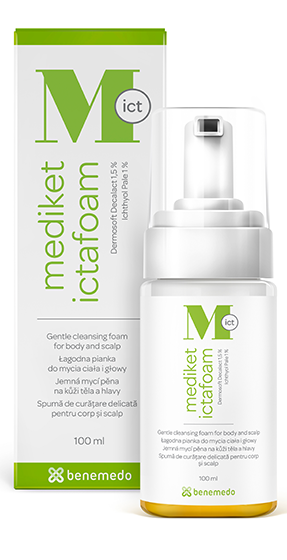 Ictafoam reduces itching, regulates skin sebum production and relieves body odour, caused by perspiration metabolism. Pump to obtain appropriate volume of foam. When using on body and face apply to wet skin and massage into the skin, then rinse off. 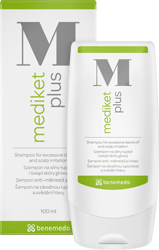 When using on scalp apply to wet hair, massage the scalp and leave on for 3–5 minutes, then rinse off. Long hair may require two or more applications. Use 2–3 times a week for 4 to 8 weeks. Thereafter, use preventively once or twice per week. Ethylhexylglycerine, Sodium Chloride, Parfum, Citric Acid, Benzyl. 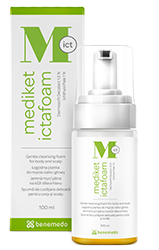 Mediket Ictafoam may be used to address body hygiene when suffering from seborrhoea or other skin irritations. The mechanical foam pump makes it possible to dramatically reduce detergents content of the product. This makes the foam much gentler, preventing damage to skins protective lipid layer. 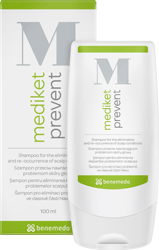 Mediket Ictafoam is the ideal solution for all skin types that require sensitive/gentle washing. Ichtyol pale and dermosoft decalact have antibacterial and antimycotic effects. They help restore a healthy and balanced skin microflora. The products pH level of 5.5 respects the natural pH of human skin. Ichtyol pale prevents inflammation, relieves itching, smoothens the skin and has antiseborrhoeic properties. The naturally deodorizing properties of dermosoft decalact prevents the unpleasant odor generated by perspiration metabolism.